The provision and use of traditional, complementary and alternative medicine (CAM) has been growing globally over the last 40 years. As CAM develops alongside - and sometimes integrates with - conventional medicine, this handbook provides the first major overview of its regulation and professionalization from social science and legal perspectives. 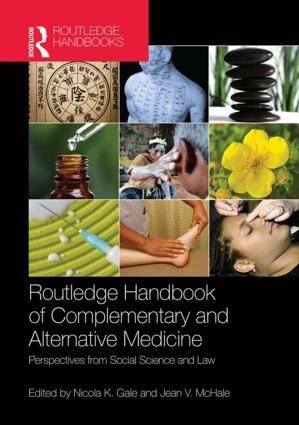 This important volume will interest social science and legal scholars researching complementary and alternative medicine, professional identify and health care regulation, as well as historians and health policymakers and regulators. Nicola K. Gale is a health sociologist based at the Health Services Management Centre at the University of Birmingham, UK. She started her career at the University of Warwick, where her PhD was a comparative ethnographic study of training colleges for homeopaths and osteopaths in the UK. Since then, she has developed a portfolio of research in the fields of health services research, public health, primary care, community-led health care and complementary and alternative health care. She is committed to theoretically-informed empirical work that helps better understand, involve and meet the needs of a diverse population. Methodologically, she specializes in place-based and embodied qualitative methods, user involvement in health care and research, and public engagement in social sciences. Her research has been published in journals such as Sociology of Health and Illness, Health and Place, Implementation Science, Medical Research Methodology, Family Practice and Complementary Therapies in Medicine. Jean V. McHale is Professor of Healthcare Law and Director of the Centre for Health Law Science and Policy at Birmingham Law School, University of Birmingham, UK. Her books include Medical Confidentiality and Legal Privilege (1993); Health Law and the European Union (2004, with Hervey) and Health Care Law Text and Materials (2nd ed, 2007, with Fox); edited collections include Principles of Medical Law (2010, with Grubb and Laing). Her new monograph, European Health Law, with Tamara Hervey, will be published in 2015.